RÍO CLARO, Puntarenas — It’s 7 a.m. at the Kilometer 35 border checkpoint and members of a Border Police squad stand in a line in brown uniforms as their commander reviews the day’s assignments. Adrian Barrantes and three other officers are to spend the morning on patrol. After migrants from Africa, Cuba and elsewhere began accumulating at the southern border in March, the government announced several policies aimed at reinforcing the country’s border with Panama to keep out individuals who lack authorization to enter the country. More than two months later, migrants — many of them without identification, let alone visas — continue to cross the border and reach the temporary Red Cross camp in Paso Canoas. As many as 170 migrants have arrived at the camp in a given day, according to Red Cross Captain José Obando. 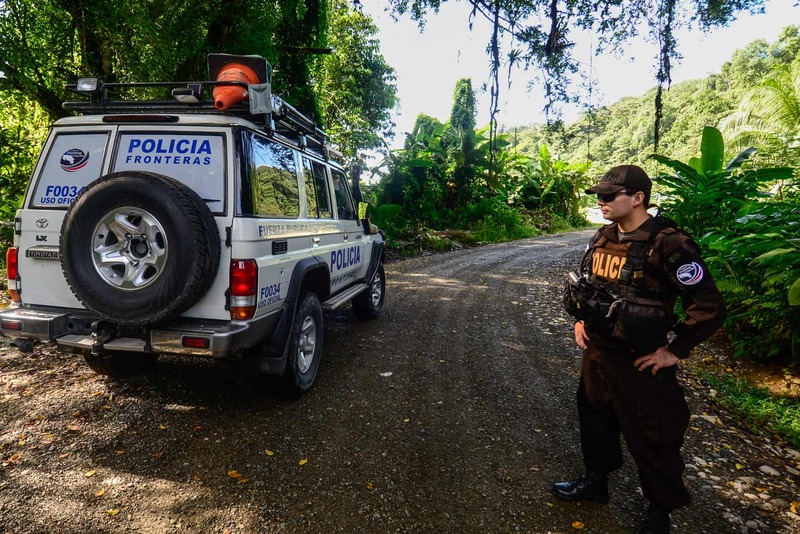 The Tico Times recently accompanied Border Police on a patrol to try to understand what it’s like to police Costa Rica’s borders and why the country can’t seem to keep unauthorized migrants out. During the approximately 160-kilometer patrol from Kilometer 35 to Gamba, Golfito, Playa Zancudo, Paso Canoas and back, it became clear Barrantes and other officers face big hurdles, including resources spread thin and a border that is so porous it’s practically invisible. Plus, despite increased funding and training from outside to beef up the country’s border security, Costa Rica hasn’t traditionally had much need for an airtight southern border. Stopping human smugglers from moving migrants into Costa Rica is just one of many tasks assigned to Officer Barrantes and the other Border Police officers. Formed in 2013 with financial assistance and training from the U.S., Border Police officers respond to everything from illegal immigration and drug trafficking to animal control and traffic violations. They are law enforcement’s first response in some of Costa Rica’s most remote territory. The squad gets into a white Toyota Land Cruiser and sets off. The Offspring’s “The Kids Aren’t Alright” plays on the radio. The truck turns off the Inter-American Highway down a stretch of gravel road into the Gamba, a remote area just north of the Pacific town of Golfito. Row after row of oil palms stretch along either side of the road. Barrantes stops the car at an intersection and sets up the first of several temporary checkpoints that day. This is one of many backroads smugglers and other people trying to avoid police use to skirt the permanent checkpoint at Kilometer 35 of the Pan-American Highway. “We know where the trouble spots are,” Barrantes says. “The idea is to try to have a constant presence in these areas,” he says of the roving patrols. 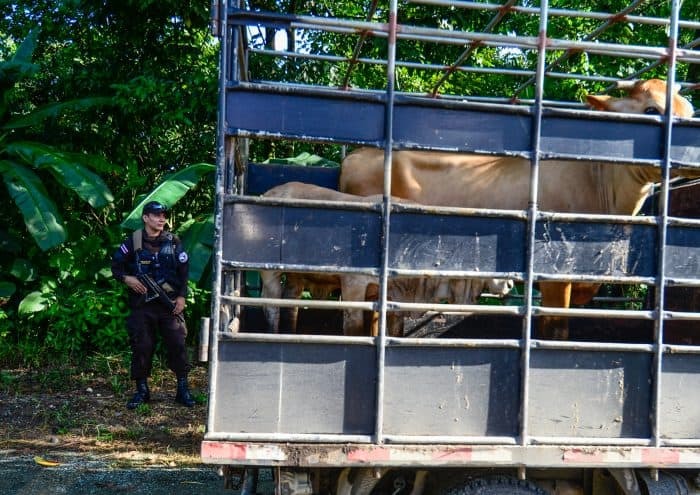 As three of the officers search a truck carrying two cows, Barrantes points out that the palm oil plantation here is one of several thoroughfares smugglers used to sneak Cuban migrants into Costa Rica in November before the government started issuing temporary transit visas to Cubans. African and other extra-continental migrants have also used it but not as frequently, he said. Barrantes said he used to spend most of his time chasing down smugglers of contraband liquor and cigarettes. But within the past year, the Border Police have put more of an emphasis on stopping human smuggling. 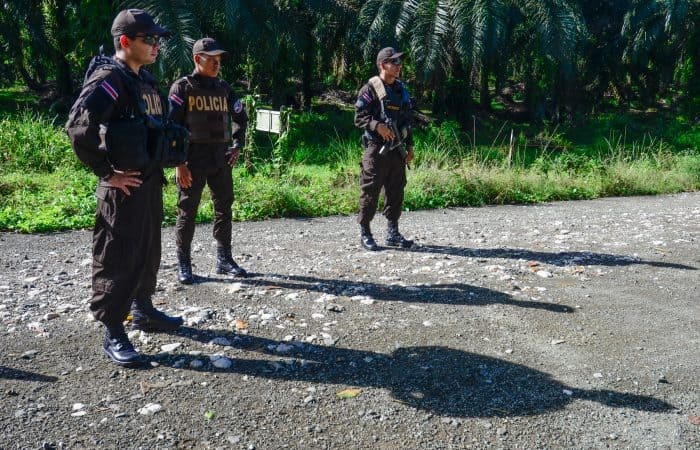 Ironically, he said the number of migrants crossing through the oil palm plantations and other remote parts of the country has fallen, in part because the Panamanians have started policing their side of the border more aggressively. Barrantes’ job has also been made easier by the Costa Rican government’s decision to tacitly let most of the migrants who make it onto Costa Rican soil pass through the country. In April, hundreds of migrants were left in limbo at the border when Panama and Costa Rica both refused to accept them. Demanding permission to cross, migrants blocked the Inter-American Highway and at least one car was damaged in the protest. Border Police were called in to help the National Police manage the crowds of migrants, and they increased patrols to try to stop smugglers. Eventually, Costa Rica agreed to issue the migrants who reached Costa Rica a piece of paper that allows them to circulate legally in Costa Rica so long as they check-in with authorities regularly. Normalizing these migrants freed up Border Police officers to get back to their other duties. After 20 minutes at the intersection in the Gamba, the officers collect the traffic cones and throw them on top of the Land Cruiser. Barrantes follows the bumpy, sometimes washed-out dirt road toward Golfito for another 10 minutes before pulling off the road at what looks like an improvised trash dump. The officers get out and walk through the trash into a clearing just behind a row of trees. “Sometimes people do drugs back here,” Barrantes explains. He says Border Police reserve their jurisdiction for places outside the bounds of a local police delegation, in this case, Golfito. The azure waters of the Golfo Dulce rush past the truck’s windows. The road is paved here and Barrantes hits the gas. There’s still more than half the patrol to finish and it’s already 9 a.m.
Out toward Playa Zancudo, the paved road shifts back to gravel. The officers set up the next mobile checkpoint at an intersection next to a wide, empty field. The first person stopped is a woman riding a motorcycle without a helmet. She says she’s driving to pick up her daughter. Barrantes says that he has to use “common sense” when dealing with situations like this. Yes, she’s not supposed to ride without a helmet but a ticket or taking away the motorcycle isn’t the answer. This could be her family’s only means of transportation, he says. Leaving her without a way to get around out here isn’t solving anything. He admits that the Border Police sometimes struggle when it comes to strict enforcement of the laws. Although the U.S. funded the Kilometer 35 checkpoint and has helped train Border Police, Costa Rica sets its own enforcement priorities. Another motorcycle approaches but makes a sudden u-turn when the driver sees the checkpoint. The officers don’t pursue it. “If you look right here, that’s all Panama,” Barrantes says as the truck snakes north up another gravel road toward Paso Canoas. There is no sign announcing the frontier. The road itself is the closest thing to a marker between the green field in Panama and the Costa Rica side. The peaceful relationship between Costa Rica and Panama actually contributes to the illegal flow of immigrants and contraband, Barrantes says. The countries enjoy good relations, making a heavily-patrolled border seem unnecessary and counterproductive to trade and tourism. In the town of Paso Canoas, you can walk into a store on the Costa Rican side and walk out on the Panamanian side. Vehicles with Panamanian license plates can drive as far as Ciudad Neily without checking in with Costa Rican authorities. The flow of people is so uninterrupted it appears at first glance to be a waste of money to pay a smuggler. Barrantes drives along a stretch of road outside Paso Canoas and points out a crooked concrete pylon that’s supposed to mark the border. “When people want to build something they’ll just move the pylon,” Barrantes says, standing in front of a cinderblock building that is mostly in Panama but likely crossing into Costa Rica. The same, however, can’t be said for the Nicaraguan border. 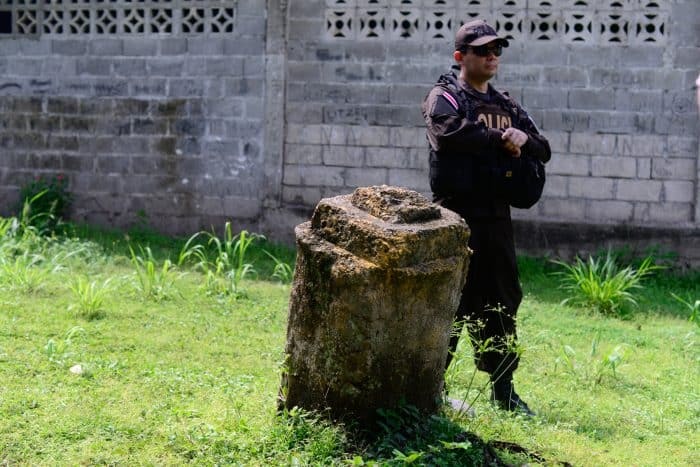 Barrantes, who is from the northwestern province of Guanacaste and is regularly called to patrol Costa Rica’s northern border, said the mood along Costa Rica’s border with Nicaragua is more tense. Across from Peñas Blancas, Costa Rica’s busiest northern border town, the Nicaraguan military patrols. The government there has continued its policy from last November of refusing entry or passage to all migrants without visas. “When Nicaragua closed its border, that’s when the problems started,” Barrantes says. The crackdown has created high demand for human smugglers. The Public Security Ministry issued a news release on June 17 reporting that a Costa Rican smuggler was arrested trying to secret four African migrants across the border into Nicaragua. The smuggler reportedly charged $750 to get the group across, according to the daily La Nación. Some African and Haitian migrants who have reached Mexico’s border with the U.S. have told local reporters that getting through Nicaragua was among the toughest parts of their journey. Heading back to the Kilometer 35 checkpoint, Barrantes reflects on the scope of the Border Police’s job.